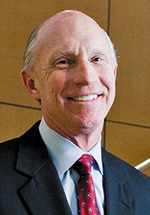 Bearden joined GS&P in 1976 as an intern architect and was named CEO in 2007. At the beginning of 2017, he stepped away from his CEO duties but remains active in the firm as chairman emeritus of the board. With more than 30 years of national and international healthcare design experience, Bearden is also serving in a senior leadership role for the company's large healthcare market and architecture practice. Bearden, who graduated from the University of Tennessee, is a member of the American Institute of Architects and is a founding board member of the Architecture, Construction and Engineering (ACE) Mentoring Program. He also serves on the board of the Nashville Health Care Council.